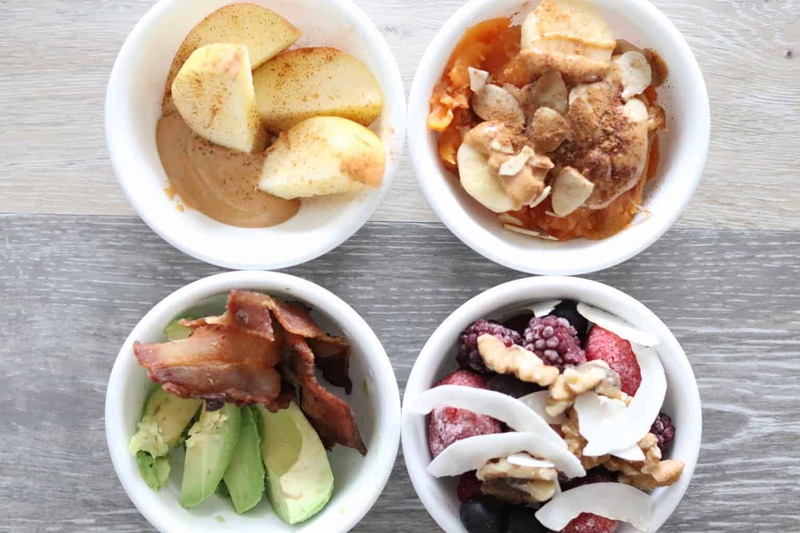 EASY AND DELICIOUS WHOLE 30 HEALTHY SNACK IDEAS. KID FRIENDLY HEALTHY SNACKS FOR ON THE GO. Grab my free whole 30 ebook to get a full week meal plan and a complete grocery list! With a house full of growing kids, a nursing mom, and a hard working dad we require a lot of snacks. So for the month of January, while we are eating the whole 30 diet, I had to come up with a few snacks that would be compliant. 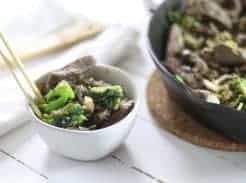 Most of these are simple snacks but I wanted to compile a list because if you are anything like me, every time you think of something you have to google it to see if it is whole 30 approved. I hope this list gives you some fresh ideas and that you will enjoy some of these healthy snack options! We have a flock of back yard chickens so eggs are something we never run out of around here. I love to have a dozen of hard boil eggs in the refrigerator for snacks. 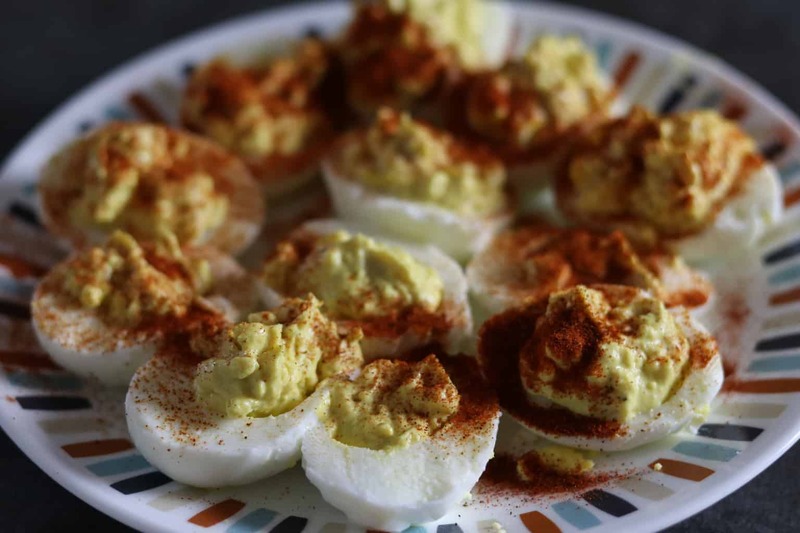 Sometimes I will get a little fancy and turn those hard boiled eggs into deviled eggs, this is a real treat! I found some whole 30 approved mayonnaise at our local grocery store, that I used to make these taste like the real thing. My kids love these and the best part; they are packed full of protein and help to fill them up. Cut the hard boiled eggs in half and remove the yokes. Add the yokes, mayonnaise, mustard, salt, and pepper to a small bowl. Mash with a fork until all the ingredients are well combined. Spoon the yolk mixture back into the egg whites and sprinkle the top with paprika. This has been our favorite snack so far, probably because we love all things hot and spicy! You can bake some chicken wings and toss them in your favorite whole 30 approved hot sauce. Serve with slices of celery. Tessemae has a whole 30 approved ranch you can buy if you want a dipping sauce to go with your wings. You can find it here. Sometimes we will fry these, instead of baking, and they taste like they are straight from a restaurant. I fry in 100% coconut oil to avoid consuming over processed, GMO, hydrogenated oils. 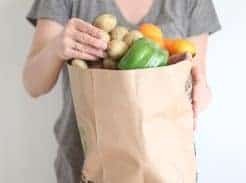 I was happy to see that almond and cashew butter were on the list for whole 30 approved foods. Peanuts are not approved because they are in the legume family, but almonds and cashews are a go! 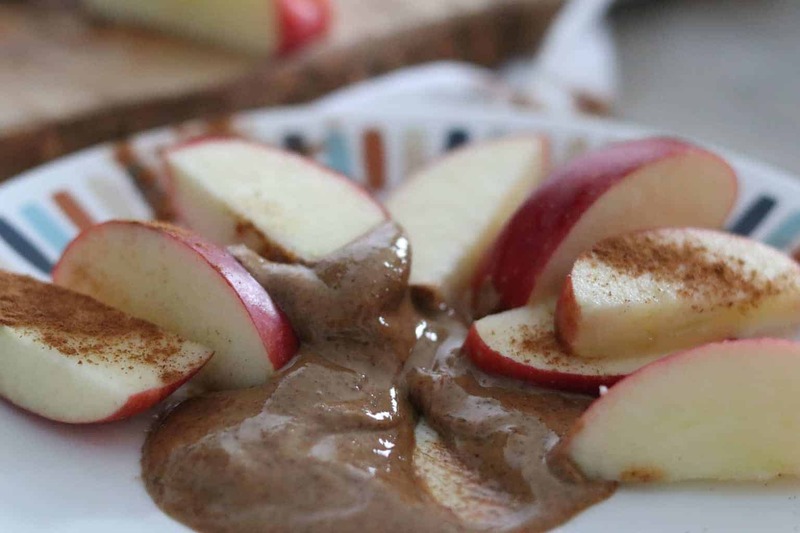 Slice up an apple and serve it with a scoop of almond butter. This makes for a delicious, filling, and simple snack. You can also cut up celery or carrots to dip in the nut butters for an alternative. Sweet potatoes contain less carbs than regular potatoes, they are higher in vitamin A, and they are a good source of fiber and potassium. They are delicious baked, smashed, or in a pancake. This snack is simple and delicious. Bake one sweet potato, remove the peel, and place it in a bowl. 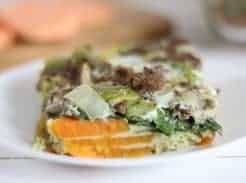 Lightly smash it with a fork and top it with slices of bananas, a scoop of almond butter, and sprinkle it with cinnamon. Enjoy! While brainstorming the whole 30 approved food lists my husband came up with this idea! This one could easily be turned into a lunch or dinner idea if you added a few sides to it. Lay out the piece of romaine lettuce and spread some avocado mayonnaise on it. 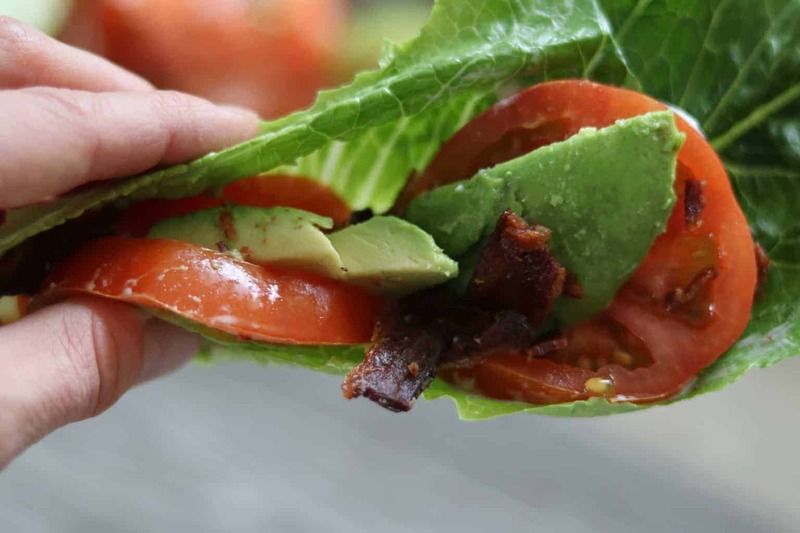 Layer bacon, avocado slices, and tomato slices on the lettuce. This is going to be more of an idea than a specific recipe. 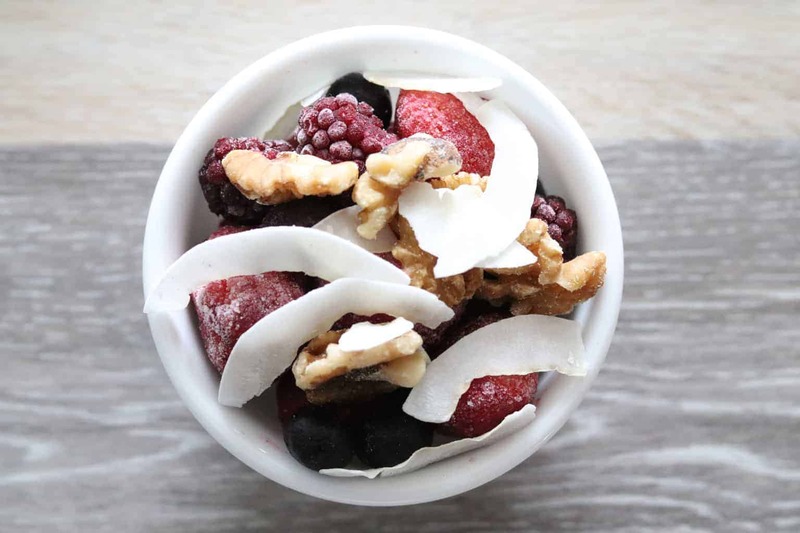 Because most nuts are whole 30 approved you can make a fruit salad topped with mixed nuts, raisins, and coconut shreds. You can sprinkle this with cinnamon and/or ginger to add flavor. Add a drop of lemon or lime essential oil to add health benefits and more flavor. If you are out and about or looking for a premed whole 30 snack then Lara Bars are the winner. There are several different flavors of Lara Bar and not all are complaint. Lara Bars are a fruit and nut bar made with just a few ingredients. Be sure to pick a bar that doesn’t have peanuts in it. Here is a list of flavors that are whole 30 approved: apple pie, banana bread, carrot cake, cashew cookie, cherry pie, chocolate coconut chew, coconut cream pie, key lime pie, lemon, pecan pie, and pumpkin. You can find Lara Bars at most grocery stores or on amazon. 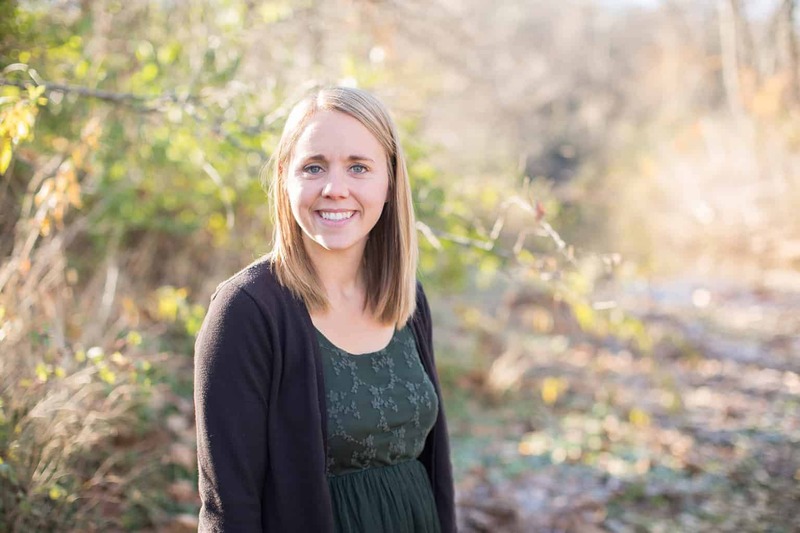 Please share your whole 30 snack ideas with me in the comments below! I love trying new things and always looking fore more ideas. These are really great looking, healthy snack ideas! Yum! 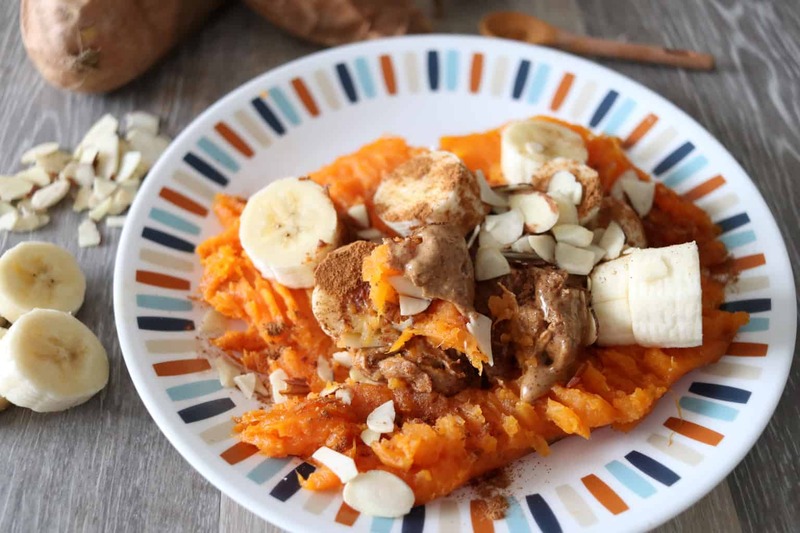 I wouldn’t have thought to put banana with sweet potato, but it looks really goood! It is a delicious combo! These all look so yummy! I’m definitely going to start making deviled eggs for snacking. I love having these in the fridge for a quick and healthy snack! Everything looks so good!! Apples and almond butter are my favorite !! I’ll be trying everything out!! I love sweet potatoes and that makes me want to try it with bananas! I’m usually boring and just eat them plain but yours looks delicious! I’m always looking for healthy snacks! Thanks! These look delicious. Love the chicken wings – a family favorite here! Love this! My kids are constantly begging for snacks and I needed ideas. We love Larabars but our favorite is the peanut butter chocolate chip…. probably the least healthy of all! The cherry pie is so good and I love how tart they are. We love those Lara Bars too! I love having Lara Bars on hand for a quick and easy snack. What great ideas! I have some pre-baked sweet potatoes in my fridge that we need to eat before they go bad. Now I know exactly what we’ll be having for breakfast tomorrow morning! I am so glad you enjoyed this post and got some good ideas from it! !